In life, there are things you should do and there are things you shouldn’t do. In the “should do” category: drink as much Concrete Ship as you can responsibly handle. We first started brewing Concrete Ship in July of 2015, as the very last of our Employee Series. It was so well-received that we brought it back in December of last year. Russian Imperial Stouts were originally brewed at the request of Empress Catherine the Great. 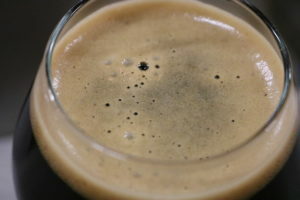 She needed a robust brew that would stand the test of the treacherous, thousand-mile trek from London to Eastern Russia, and these full-bodied, heavy stouts were just the thing. 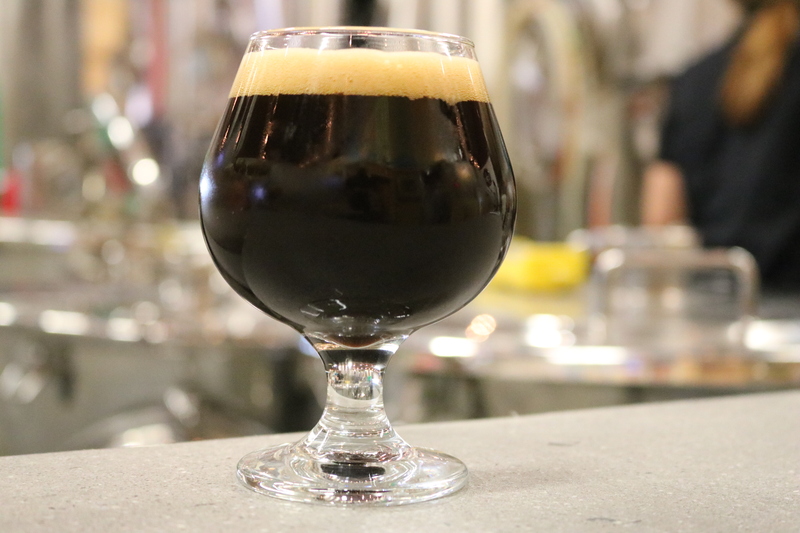 “Russian Imperial Stouts are usually north of 9% ABV and have a heavy, roasty body, reminiscent of dark chocolate notes and a subtle background caramel/vanilla-like sweetness,” Head Brewer Brian Hink informs us. Snuggling up under a blanket with one of these is exactly how we intend to spend this entire winter. It’s already too cold. Nonetheless, both Jimmy and Brian agree: the great thing about Concrete Ship is its balance. “The dark chocolate and the roasted malt flavors are harmonious with a touch of toffee malt sweetness on the finish and the pleasantly subtle notes of the higher alcohols,” Jimmy agrees. Sounds like a great holiday to us! So now, in the “shouldn’t do” category: build a concrete ship and expect it to do anything other than sink. We named Concrete Ship after the SS Atlantus, a concrete ship currently inhabiting a watery grave off Cape May Point’s Sunset Beach. Basically, if you construct anything into a shiplike formation, it’ll float — ships float because they’re essentially a bucket of air. These concrete behemoths definitely did the job; however, at 3,000 tons, they weren’t particularly cost-effective. And, as you might imagine, 3,000 tons of concrete isn’t exactly going to be winning any races. These things were huge, expensive, and slow. Even better, the fleet of twelve ships wasn’t complete until after the war. In 1926, a wild wag of an entrepreneur named Colonel Desse Rosenfeld saved the SS Atlantus from a ship graveyard in Virginia, planning to move it to the Delaware Bay to serve as a dock for a ferry between Cape May and Cape Henlopen in Delaware. Obviously, the ferry was a great idea, but, after it was towed here, the SS Atlantus broke free from her moorings in a storm and ran aground. Thus ended the great concrete ship experiment of WWI. 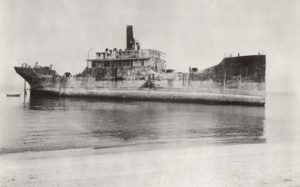 The SS Atlantus is still visible from Sunset Beach. For years it was a permanent advertisement for boat insurance — literally. Someone named A.M. Bianchi painted a billboard promoting his company sometime in the 40s. Now, it’s slowly decaying, and soon it will disappear completely from view. In the meantime, Concrete Ship — the beer — is on tap now. Grab some before it disappears completely from view.